Tipped plastic bottles are an environmental nightmare and create a major rubbish removal blight across the landscape. Plastic debris kills more than one hundred million marine mammals every year and more than half of all oceanic plastic is plastic bottles. 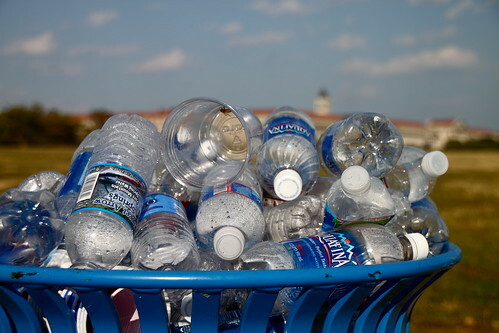 Keep in mind too that recyclable plastic bottles are made of polyethylene terephthalate (PET). This petroleum material does not biodegrade. Instead, it breaks down into tiny nano sized plastic particles that absorb toxins and then get incorporated into our soils and water. So, when these PET bottles are not returned for recycling, they can cause a variety of health problems for both people and wildlife. In many countries, deposit return schemes are being used to entice people to actually recycle their plastic bottles rather than tossing them in the rubbish removal bins. These are essentially a refundable "bottle tax" or "bottle deposit" where the consumer is charged a certain amount extra for just the plastic bottle when they buy a product contained in a plastic bottle. Then, the consumer gets the bottle deposit back if they return the bottle and they lose the deposit if they don't. Countries who are doing these deposit schemes have reverse vending machines available at supermarkets and other convenient locations so that consumers can put their plastic bottles into the machine and out pops a voucher for the deposit. There is very good visual evidence that these deposit return schemes truly work just by comparing the plastic bottle blight situation where they are used and not used. No place is this more true than Australia. In this country, different states have adopted different laws about deposit return schemes and this really reveals itself visually as you travel around the country. For example, in the state of South Australia, they have had deposit return schemes for about forty years, the longest in the country. On the other hand, in the neighboring state of Victoria, they have yet to implement a deposit return scheme on plastic bottles. In an interview with The Guardian, Nina Meredith Springle, a member of the Legislative Council in Victoria, stated, "You can see garbage as soon as you cross the border... In Victoria there’s a marked increase in the amount of plastic pollution that you see with the naked eye.” She was referring to traveling from South Australia to Victoria. So, the visual difference in plastic bottle blight is so stark, you don't need a scientific study or statistics to understand that the deposit return scheme in the state of South Australia is affecting in a big way the low levels of plastic bottle pollution they see in that state versus what one sees in the state of Victoria. Luckily, there are several other Australian states now planning a deposit return scheme in the near future and these will be coordinated across the entire country. Hopefully, the UK will join the Australians in implementing a deposit return scheme that will deter people from littering and throwing their plastic bottles in the rubbish removal bin! The stark difference in plastic bottle blight between the two states of South Australia and Victoria is reminiscent of a joke they tell in the state of Louisiana in the United States. On a road trip, you can be sleeping in the back seat of a car coming back from the state of Texas. As soon as you cross the border, the road suddenly turns decidedly more bumpy (for lack of funds to repair and maintain the roads) and you'll be instantly jarred awake. You'll know you're home by the sudden appearance of all the pot holes just like the Victorians known they're back from South Australia when they see the plastic bottle blight. How much do deposit return schemes help in keeping the plastic bottle blight off the landscape and keeping these plastic bottles out of the rubbish removal bins where they'll most likely end up in the landfill? Besides it being visually obvious, the numbers speak loud and clear too! Sweden introduced a deposit return scheme in 1994 for plastic bottles and they now have between an eighty to ninety percent recovery rate! Norway introduced a deposit return scheme in 1999 and they now have between a seventy-five and ninety percent recovery rate. Germany introduced a deposit return scheme in 2003 and they have near a ninety-nine recovery rate! You may be asking yourself how Germany has an even higher return rate for plastic bottles than the Scandinavian countries like Norway and Sweden. Part of the answer may be due to the fact that the German society has gone crazy for recycling and there is very high social pressure to be a good citizen and recycle everything you can. However, the answer may be more basic than that. They also charge more for their plastic bottle deposits than other countries which gives their citizens more of a monetary incentive to return their plastic bottles. Currently, they charge about twenty-five percent more than the deposits charged in the Scandinavian Countries. This may be a good lesson the UK can use when determining how much to charge for their rubbish removal deposit return scheme! Clearabee, the popular rubbish removal service in the UK, has been pushing for the UK to reach the recycle rate for plastic bottles and other rubbish that other European countries have already achieved. Unfortunately, the local councils have not reached those levels yet but we can only keep encouraging them to do so with the leadership of Clearabee and other ecofriendly businesses and organizations. We don't want an obvious sudden blight on the landscape as soon as a traveler crosses into England from other European countries!